MONKEYS ARE MY FRIEND: Yet Another Pair! 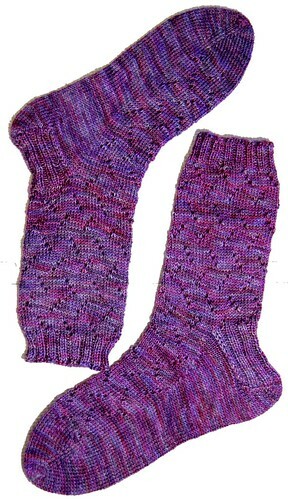 I just finished my most recent knitting project: more socks! This one was a fun little challenge - the pattern was written to be knit from cuff to toe and (as part of a test knit from the designer), I got to figure out how to knit the socks reversed, from toe to cuff! I'm really pleased at how they turned out - I think they look just like the original pattern, heel flap and everything! Needless to say, my project notes are fairly extensive for this one. Mostly because I had to rewrite the pattern to do it toe up. Ultimately, I did manage to get the lace pattern on the socks backwards but since it took me a bit comparing pictures to figure that out, I'm content. Technically, I have a cardigan next on my to-do list but I really, really need to learn to use my sewing machine so I can finish off one project that has been sitting, abandoned since mid-April for want of a zipper and lining. So my cardigan is going to have to wait for me to learn to sew (again). I really should have finished up that project before starting these latest socks. In my defense, I didn't mean to knit these socks at all. But the test knit popped up and I couldn't resist. I have no impulse control. But that's okay, because I have more socks! Do I Love My KA Switch Interchangeables?